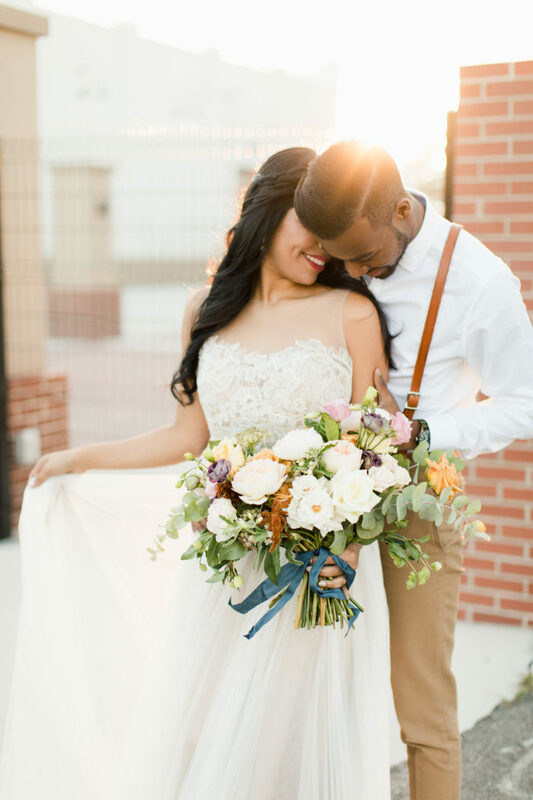 Our bohemian, Old-World inspired style shoot was featured on Green Wedding Shoes just a few days ago. We are finally able to share these amazing shots by Justin DeMutiis of this gorgeous gallery. When Nuage Design’s sent us their new linens (Indigo Batik, Mauve Velutto, and Floral Monet Napkins), we were immediately hooked. The Chambray texture of the Indigo Batik was both beautiful and relaxed, and we wanted to bring romance and formality to the otherwise casual linen. We found ourselves in the middle of a look that brought bohemian and modern elegance together cohesively. When looking for the perfect spot to host this vision, Haus 820 came immediately to mind as it offers a blank canvas to fit any aesthetic. 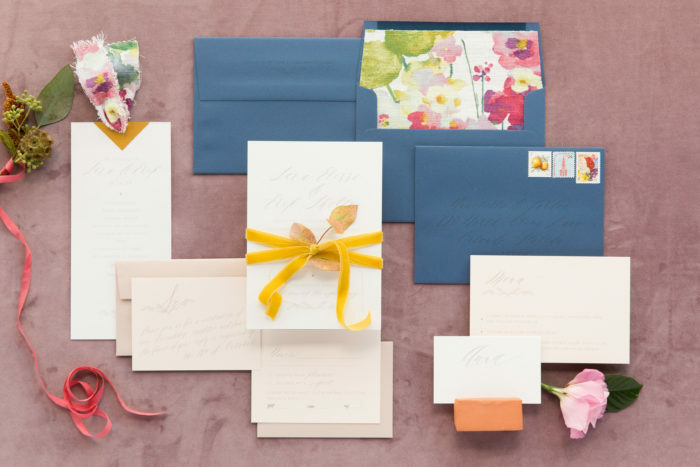 Eleven Note created the most elegant stationary for this shoot. Nuage actually mailed fabric from the Floral Monet line for her to use with the programs and envelope liners. 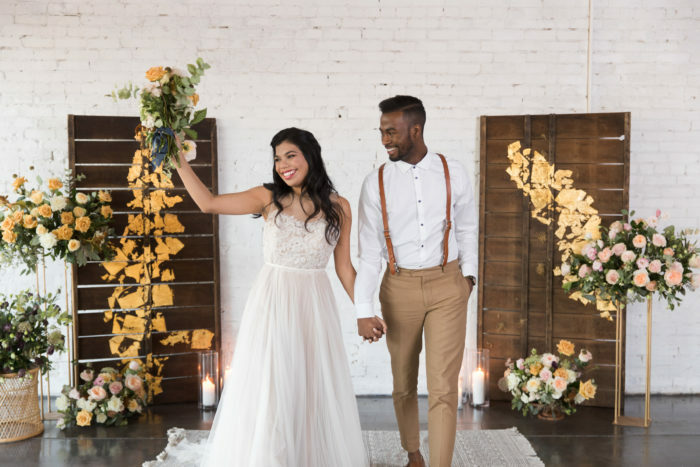 The marigold velvet ribbon was the perfect pop to the subtle, layered suite. 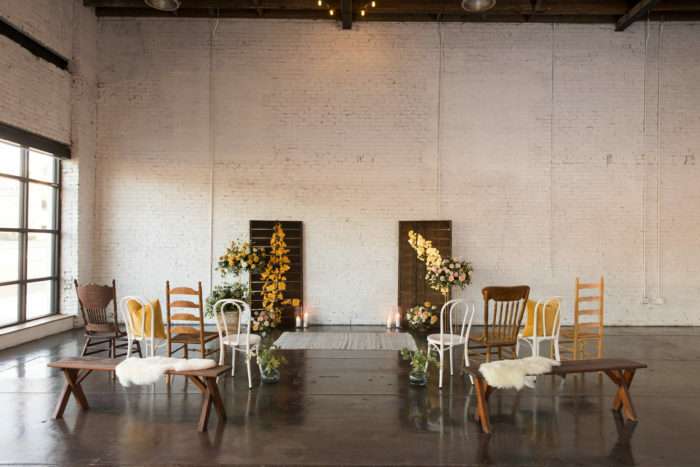 The ceremony space had a unique twist, utilizing a mixture of seating and wood backdrops provided by Revel + Co. and Wish Rents. 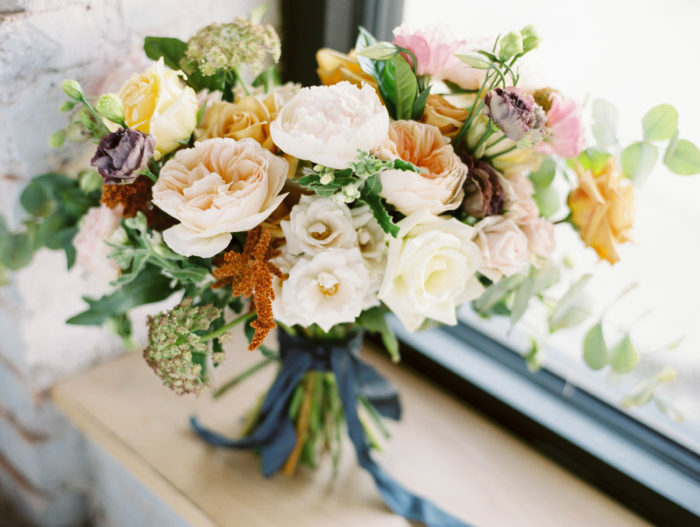 We love the mixture of textures and styles that tied together so perfectly with our floral designs. 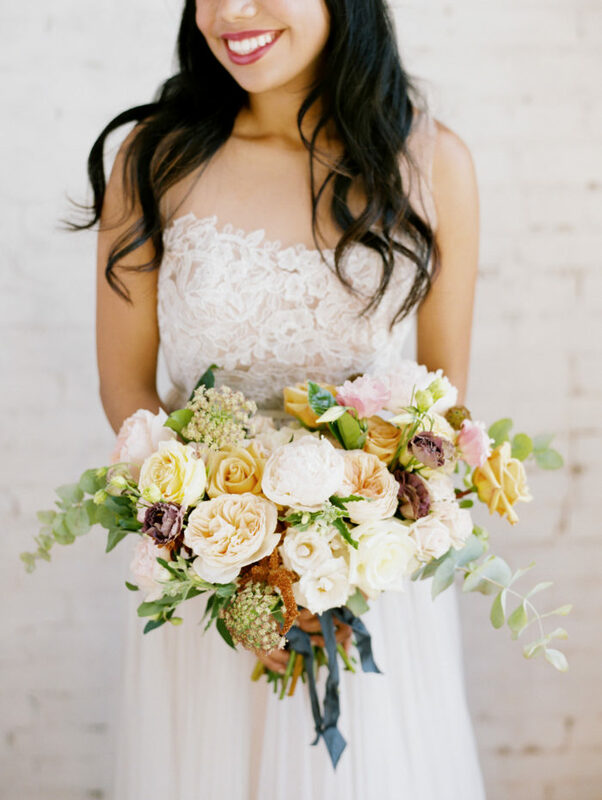 We loved that the florals in the shoot really served as the backbone of the beauty. 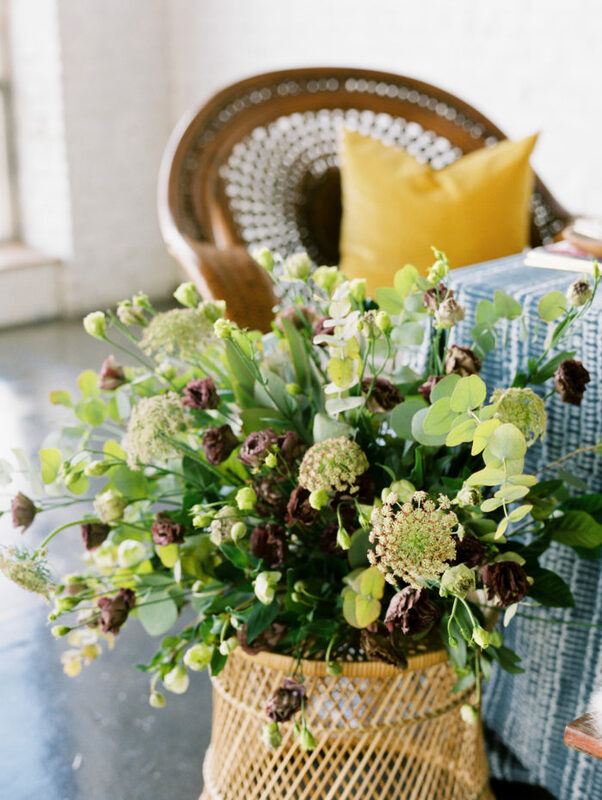 From the myriad of colors and textures in the flowers and greenery to the blue ribbon, the abundance in florals brought natural elements indoors. White Magnolia Tampa provided a beautiful and elegant lace and chiffon dress to match our vision. It also complimented the groom’s attire, especially the snazzy suspenders provided by Boondock Studios. 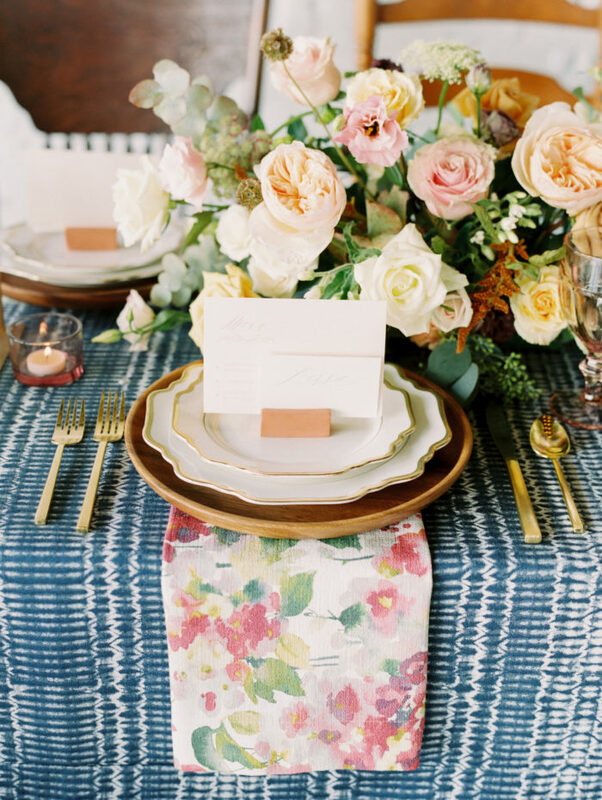 The reception table was full of fun patterns and colors. Treasury Rentals provided elegant gold-accented flatware that paired so well with Nuage Design’s Floral Monet napkins. 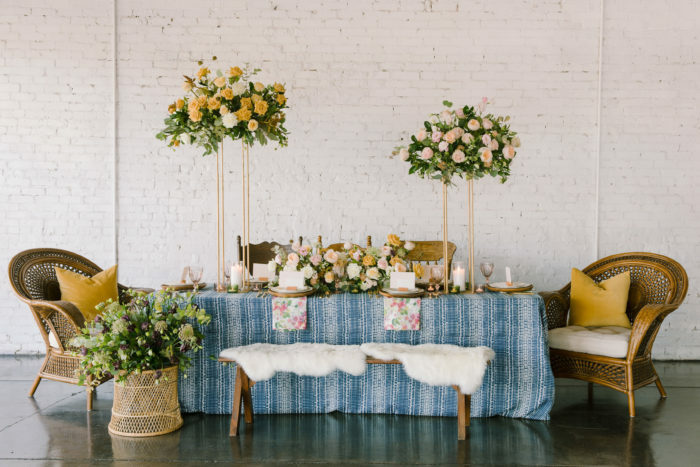 We also love the wicker chairs provided by Revel + Co.
Fresco’s provided a beautifully elegant and clean cake to matched perfectly with a floral backdrop. 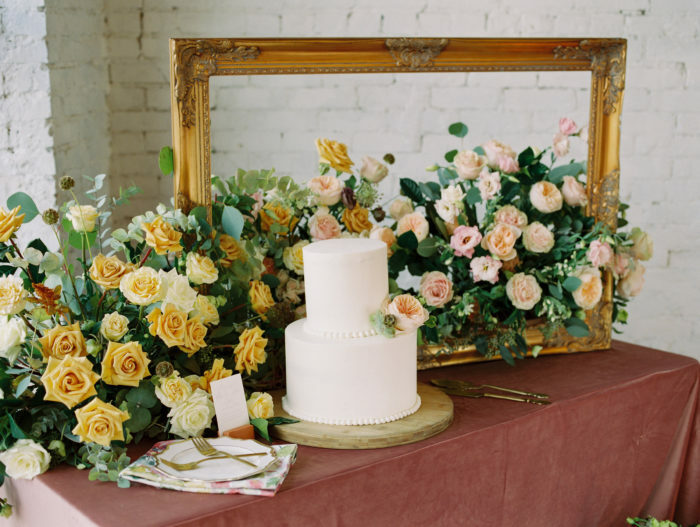 The Mauve velvet linen, provided by Nuage Designs, was a perfect pop of color for the cake table. We want to to thank all of the wonderful vendors that made this shoot possible.